A cataract is a partial or complete opacity (cloudiness) of one or both eyes. This usually occurs in the lens or capsule and can impair (interfere with) vision to the point of blindness. 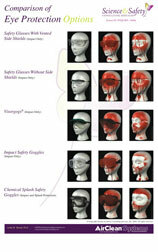 Ensure workers understand what eye protection is really all about with safety posters from Safety Emporium. The incidence of cataracts increases with age. The cause of cataracts is not often known, however certain diseases such as diabetes are associated with cataracts. Overexposure to the sun (UV radiation), smoking, hot work environments (such as furnaces or glassblowing), pesticide exposure, certain chemicals, as well as ionizing radiation can also increase the risk. Cataracts can be treated with corrective lenses, medication and/or surgery. Replacement of the lens with an artificial lens is successful in approximately 98% of cases. "The Cataract Surgery Book: Options & Explanations for Patients", Paperback, 91 pages, 2018. Estimated price $13.99. Info and/or order . "Cataract Surgery And Phacoemulsification For The Beginning Surgeons", Paperback, 312 pages, 2014. Estimated price $22.85. Info and/or order. "Cataract Surgery: A Patient's Guide to Cataract Treatment, 3rd Ed", Paperback, 160 pages, 2016. Estimated price $22.95. Info and/or order. Prolonged (chronic) exposure to certain chemicals can cause cataract formation in the eyes, or a condition closely resembling cataracts. Examples of such chemicals include naphthlene, bendiocarb (a pesticide), potassium isocyanate, ethylene oxide, dinitrophenols, ammonium hydroxide, and osmium tetraoxide among others. The damage that these substances cause to your eyes may or may not be reversible. If you must use substances that can produce eye damage or cataracts, be sure to use proper administrative and engineering controls to prevent the release of the substances into your work environment. Good ventilation is very important. Personal protective equipment (PPE) such as safety glasses and goggles offer no significant protection from fumes or vapors, so do not rely on these to protect your eyes! Air-supplying or PAPR respirators with full face masks are a good alternative, but simple dust masks or HEPA filters are ineffective against chemical fumes and vapors. Visit the Cataracts FAQ at Johns Hopkins Medicine. Cataract: What You Should Know at the National Eye Institute (part of the U.S. National Institutes of Health). Cataracts Causes, Symptoms, Types, Treatment and Surgery Risks at eMedicineHealth.com. Cataract at the NIH's MedLine Plus Medical Encyclopedia. Simulation of Cataracts at Cataract Eye Surgery (requires Flash). Ocular studies, including sleep, glaucoma and cataracts at BioMedSearch, a search engine for highly technical info on the topic. Cataract Educational Videos at Barnet Dulaney Perkins Eye Center. See also: conjunctivitis, eye wash, sclera.